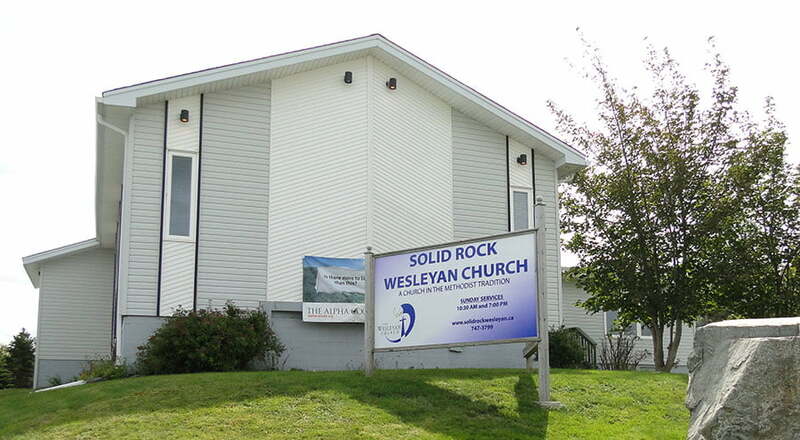 The launch of Solid Rock Wesleyan Church was approved by the Executive committee of the District Board of Administration of The Atlantic District of The Wesleyan Church in February, 2000. In March of the same year the name “Solid Rock Wesleyan Church” was approved and Rev. Frank Winsor was appointed as Church Planter, effective July 16th. The first services were held on October 15th with 40 present in the morning and 23 in the evening. The passion of the founding group was for a church where the Scripture is honoured as The Word of God, where the Gospel is unashamedly proclaimed, where people can be fed and grow spiritually, and where people can belong and find fellowship. The early services of SRWC were conducted in Mount Pearl, at Admiralty House and the Track & Field Clubhouse. On December 16, 2001 a more permanent location was opened at 80 Glencoe Drive in Donovan’s Industrial Park but rising rental costs forced us out of that location just fifteen months later. From there we moved to The Fluvarium in St. John’s for just over a year. Following the departure of Pastor Frank and Cora Winsor, Rev. Stewart and Phyllis Steeves came as interim Pastor and during his brief tenure, by the grace of God, we were able to purchase 111 Park Avenue with a mortgage of just $175,000. Services commenced here on March 14th, 2004. On Sunday May 9th, 2004, Dr. H.C.Wilson, then District Superintendent of The Atlantic District of The Wesleyan Church, conducted a very special service at SRWC. In one service the building was dedicated to the glory of God, and the first members of SRWC were received allowing the church to cease being a church plant and become the first fully recognized Wesleyan Church in the province of Newfoundland and Labrador. What a great celebration took place! The Steeves’ were ultimately replaced by another interim Pastor, Pastor Sam and Mabel Johnson. Joining the team were Rev. Graham and Rebecca Perry. Pastor Graham began as assistant Pastor and then became Senior Pastor when Sam and Mabel “retired.” He was assisted by his wife, Rebecca, and for a short time, by his father, Rev. Walter Perry. During the Perry’s time at SRWC a great emphasis was put on missions and several members of the congregation were able to enjoy short-term missions experiences in Swaziland and Ukraine. Pastor Graham and Rebecca moved on to Trinity Wesleyan Church in Bristol, NB, in the summer of 2009 and were replaced by Pastor Mark and Susan McClusky. The Steeves’ once again completed a short interim spell here in June 2010 and the present Pastor, Rev. Stuart Marples, along with his wife, Kellie, arrived from Brockville, ON, on August 1st, 2010. An additional house and lot beside the church building, 107 Park Avenue, were purchased in 2008. Most of the oversized lot was claimed for church parking, and the house re-sold for a small profit on just a standard size residential lot in 2011. The prayer and desire of Solid Rock is to see more Wesleyan Churches established in Newfoundland and Labrador. Efforts to partner with Avalon Wesleyan Church in 2012 and Prodigal Church, 2015-2017, have not proven sustainable but we celebrate the passion of those who have participated in these ventures and look forward to the day when more churches will be planted.